was working on other cards for tomorrow, this weekend. Today's card is for the Penny Black Saturday Challenge. The challenge this week is GREEN. I love this darling little Lassy! I made a tri-fold card using gingham and green papers from my stash. The image is cut from a scalloped oval nestie die. 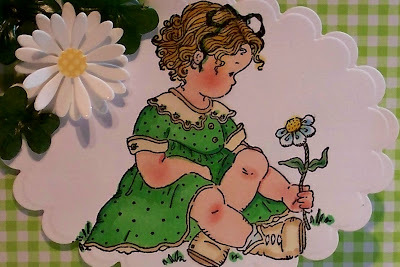 The daisy is from K&Company, the shamrocks are silk from the craft store. The border punch is a Martha Stewart. I faux stitched around the edges. I colored with Copics. The base card is made from cream textured card stock. Here is the card open. The sentiment is a dollar stamp from Michael's. 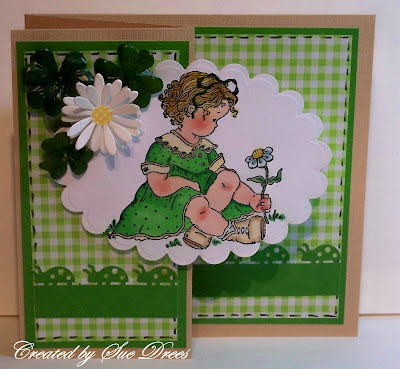 I'm also entering this card in the Stamp Something challenge this week, which is green and cream. sue this is beautiful, love the image. you have used beautiful paper and a great flower. such a pretty image and I love the gate fold card! Your coloring as usual rocks! Perfection! Your coloring is gorgeous and the card couldn't be more delightful -- I am green with envy! Oh this is so cute, fabulous card Sue.